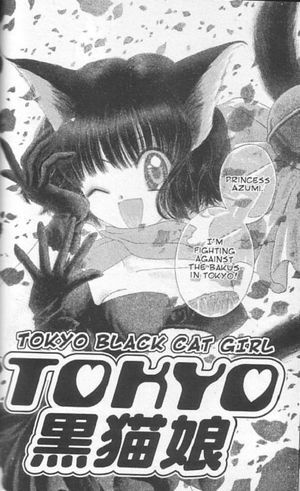 Writer Mia Ikumi came up with the idea for a manga called Tokyo Black Cat Girl. The story followed the heroine Hime Azumi after an intergalactic police officer named Masha gave her cat-like powers to aid him in his battle against alien invaders called Bagu. She presented the idea to her editors at Kodansha Comics and it was published in the winter issue of Nakayoshi magazine in 1999. Although they liked the idea, they wanted some changes made to the overall concept to instead focus on five female superheroes with a more upbeat tone. Ikumi spent the next year developing the revised series. Ikumi presented the revised series to her editors. Wanting additional fine tuning, Kodansha hired Reiko Yoshida to be the series’ scenario writer and story supervisor, which was unusual as the manga writer typically handled all aspects of preproduction. Yoshida and the editors came up with the plot, stage directions and dialogue before it was given to Ikumi. Ikumi would then add her own ideas and make whatever changes she deemed necessary. The story was then presented to the publisher for final review and approval before art began on the story. 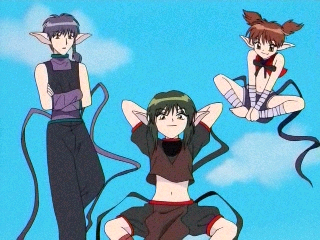 Tokyo Mew Mew's heroes: Mew Pudding, Mew Zakuro, Mew Ichigo, Mew Lettuce and Mew Mint. The story centered on the discovery by a scientist named Dr. Shirogane that there was an ancient civilization on Earth called the Chimera. The Chimera were forced to leave Earth after a series of catastrophes to an even worse planet where they dwelled underground. The Chimera sought to return to Earth but became disgusted with the environmental damage humans had caused to the planet. They decided to accelerate that damage to destroy all life and reclaim the planet for themselves through creatures known as Chimera Animas; blob-like parasites that could possess animals and turn them into monsters. The aliens were led by Deep Blue, who had come to Earth years prior and assumed a human form to avoid detection. Carrying out his will were Kish (meant to be Quiche, voiced by Daisuke Sakaguchi), Tart (Kiyomi Asai) and Pie (Nobutoshi Canna) who all controlled the Chimera Anima. The girls, Ryou and Keiichiro at Cafe Mew Mew. After a lab explosion killed Shirogane and his wife, their teenaged son, Ryou (Kouichi Toochika), continued what became known as the Mew Project with his father’s assistant, Keiichiro Akasaka (Hikaru Midorikawa). The Mew Project sought to combine human and animal DNA as a means to fight against the aliens. Ryou attempted to directly inject the Chimera Anima with endangered animal genes directly to see if that could also reverse the effects of their possession, but an earthquake hit Tokyo and caused the experiment to bombard five girls with the genes instead. Ryou and Keiichiro formed Café Mew Mew to serve as a base for the newly-powered Team Mew Mews, as well as provide a place for their civilian identities to work. The leader, Ichigo Momomiya (Saki Nakajima) was given the cat-like abilities of the Iriomote cat; spoiled rich ballerina Mint Aizawa (Yumi Kakazu) was fused with the blue lorikeet; shy and smart Lettuce Midorikawa (Kumi Sakuma) bonded with the finless porpoise; hyper and young Pudding Fong (Hisayo Mochizuki) received the golden lion tamarin; and professional model Zakuro Fujiwara (Junko Noda) was fused with the gray wolf. Each girl had a similar, but unique, mark on their body identifying them as a Mew. They transformed with the aid of special pendants and took on physical aspects of the animals they were bonded with. When powered-up, the word “Mew” was typically added to their first names as their code names. Ryo supplied the girls with a robot named R2000 (Noda) that could help them locate Chimera Anima and a powerful substance called Mew Aqua, which could be used against the aliens. Ichigo eventually named R2000 “Masha” after her boyfriend, Masaya Aoyama (Megumi Ogata). Additional girls were designed by Ikumi, but those were rejected as the options were narrowed down. An editor originally wanted to abandon Ikumi’s notion of naming all the lead characters after food (besides the obvious, Ichigo meant “strawberry” and Zakuro “pomegranate”) as they might be too hard to remember, but the names stayed. Ikumi jokingly suggested calling Ichigo’s main attack “Strawberry Bell Bell”, but the editorial team found it funny enough to keep and all future attacks would be named after whatever sounded the funniest. Ichigo's bell weapon cosplay toy. 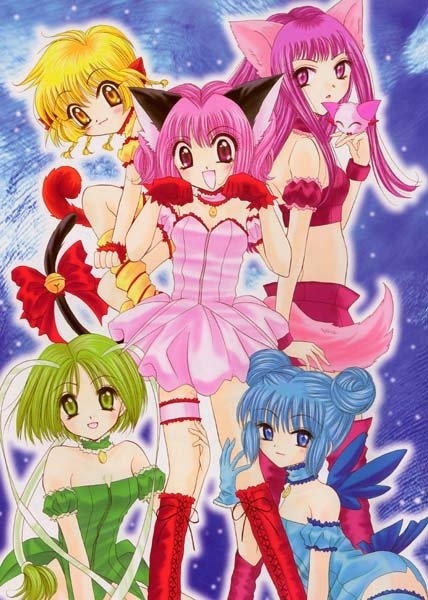 Tokyo Mew Mew was published in serialized form in Nakayoshi from September 2000 to February 2003, which were collected into seven volumes beginning in 2001. Tokyopop licensed the manga for translation and publication in North America beginning in 2003. The series became a hit on both sides of the ocean. To celebrate the first volume’s release in Japan, a two-day Tokyo Mew Mew festival was held during the Golden Week holiday. Special merchandise was sold, including a poster by Ikumi. Ikumi also attended dressed as Mint and Lettuce each day. The popularity of the series led to massive marketing tie-ins, from apparel to toys to video games, as well as a sequel series Tokyo Mew Mew a la Mode. 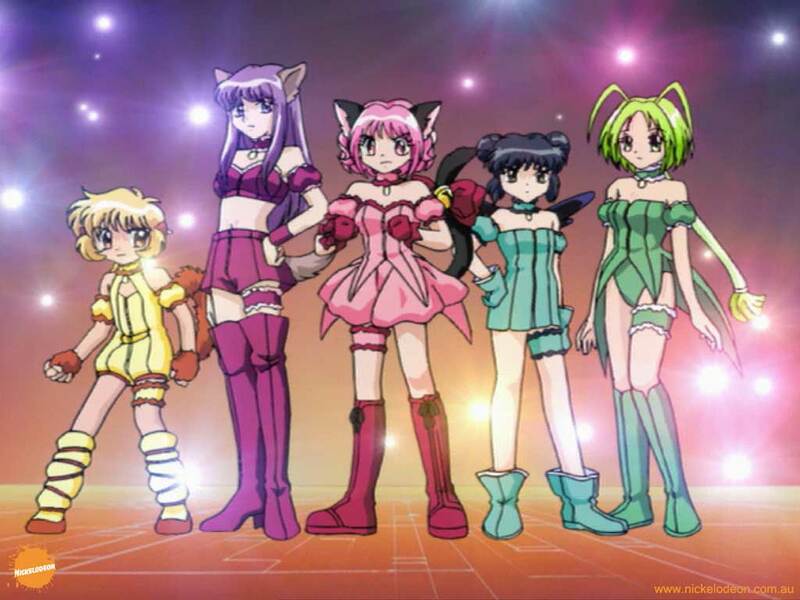 Studio Pierrot, Tokyu Agency and AEON, Inc. (later We’ve, Inc.) adapted Tokyo Mew Mew into a 52-episode anime that aired weekly across two seasons on both TV Aichi and TV Tokyo. 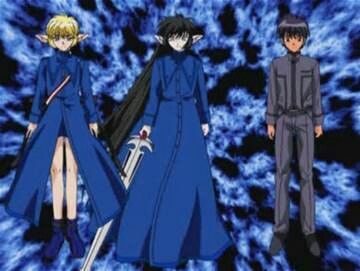 The series began on April 6, 2002 with scripts written by Akatsuki Yamatoya, Masashi Sogo, Natsuko Takahashi and Tetsuo Tanaka. Shin Yoshimura and Takayuki Negishi created most of the music for the series, with “My Sweet Heart” by Rika Komatsu serving as the opening theme and “Koi wa A La Mode” by the Mew Mew voice actors used for the ending theme. Mari Kitayama handled the character designs and took them straight from Ikumi’s artwork, following her approval. Like many similar shows, the girls would transform via stock elaborate transformation sequences where their uniforms and animal attributes would appear. 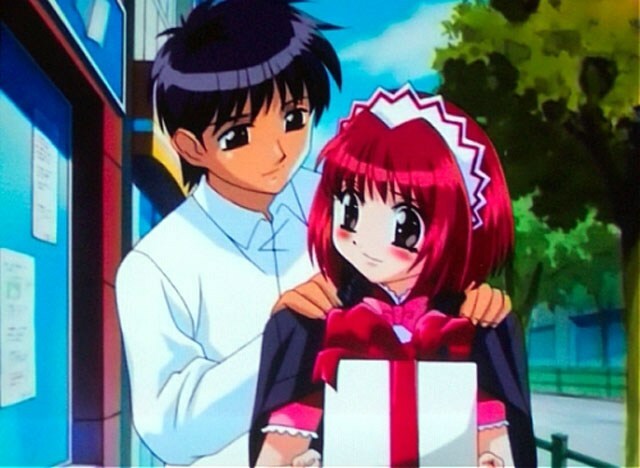 Aside from the main storyline, one of the key focuses of the series was on the relationship between Ichigo and Masaya. Ichigo initially had problems juggling her secret identity while dating Masaya, and Masaya was always stepping in to try and protect her. Eventually, Masaya developed abilities himself allowing him to become the Blue Knight. That transformation was soon revealed to come about due to the presence of Mew Aqua in his body, and the fact that both identities were aspects of Deep Blue, which is why all three were performed by Ogata. Deep Blue wouldn’t appear until the sixth volume of the manga, despite his presence being felt through his minions throughout the series. 4Kids Entertainment licensed the series to adapt it for the English-language market. In order to make the series more appealing to international audiences, a great deal of Japanese references and signs were altered or removed. Character names were Americanized, so that Ichigo became Zoey Hanson (Amada Brown), Mint became Corina Bucksworth (Andi Whaley), Lettuce became Bridget Verdant (Bella Hudson), Pudding became Kikki Benjamin (Kether Donohue), Zakuro became Renee Roberts (Mollie Weaver), Ryou became Elliot Grant (Sean Schemmel), Keiichiro became Wesley J. Coolridge (Andrew Rannells), Masaya became Mark (Scottie Ray), Kish became Dren (“nerd” backwards, also Rannells), Tart became Tarb (Jimmy Zoppi) and Pie became Sardon (Pete Zarustica). Masha not only became Mini-Mew (Tom Wayland, who also served as voice director), but had a gender change as well. Only Deep Blue (Ray) and the Blue Knight (Schemmel) retained their original names; however, receiving different voice actors. In order to keep in line with Western broadcast standards, 4Kids had numerous cuts and edits made to the series. As the girls appeared naked (though without any naughty bits showing) during their transformations, portions of those sequences were omitted and any views of their whole bodies had lines and shadows removed. In the case of Lettuce/Bridget, her solo transformation was removed entirely due to her being seen naked the most; she only transformed in group shots. The Mew Mew’s marks were removed outside of their premier episodes, and Zakuro/Renee’s weapon was censored due to its resemblance to the Christian cross. The characters’ ages were all advanced from early and pre-teens to mid-teens, with Renee’s age being the highest at 17. Zoey’s animal was briefly changed to a wild mountain cat before reverting to the original, and her interests in being a girl and having a boyfriend were heightened. Corina’s level of rudeness towards Zoey was increased as well as developing the ability to sing, and it was alluded to that her admiration of Renee had become romantic interest. Bridget was less of a pushover and strove to be popular. Kikki was initially said to be homeless and very secretive about her life, but her home life was later shown. Renee’s principal profession was changed from modeling to singing, and she had even less tolerance for the other Mew Mews. Mark was aged as well, becoming him a popular jock, while Mini-Mew was given the ability to speak in complete sentences. Elliot and Wesley lost their scientific connections and became just rich high schoolers, with Wesley being the only character de-aged. The aliens, now named Cyniclons, were given new motivations to seem less heroic and more evil. They were changed to a race who were unable to maintain the planets on which they lived, and became jealous of the humans of Earth for being able to keep their planet livable. Dren’s personality remained largely unchanged, but his lust for Zoey was toned down. Sardon became the only Cyniclon with named attacks, and Chimera Anima were renamed Predasites. Deep Blue, who wasn’t seen until the second season of the anime, continually communicated with Dren via a blue light. The Mew Aqua was also given the name Blue Aqua, with the larger forms called Blue Aqua Crystal. The many faces of Deep Blue: Blue Knight, Deep Blue and Mark. 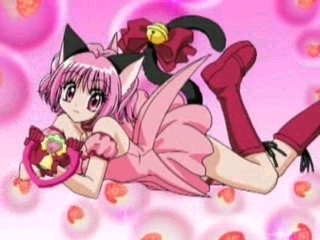 4Kids promoted the series as Hollywood Mew Mew (which ended up being the title of an episode), The Mew Mews (which was heard in the closing narration of the first episode), and by its original name before settling on Mew Mew Power. The series debuted on FOX’s 4Kids TV programming block on February 19, 2005. The original series was translated by Kathleen Westlake and served as the basis for the scripts by Barton Bishop, Jim Malone, Matthew Ordek and Ted Lewis, whose dialogue changes resulted in major alterations to the overall plots of the stories as well as a liberal addition of cat-themed puns. The original Japanese score was removed and replaced with a score by Jen Scaturro, Malone and John Siegler, with a new opening theme song by Malone and Siegler and sung by Bree Sharp. The first episode aired was actually the 12th in the original anime, and was later disregarded canonically when the next episode aired. Initially, 4Kids planned to air their pilot episode as a sneak peek in the fall of 2004, with the episode being voted on alongside an episode of One Piece and F-Zero: GP Legend. Despite being in last place for much of the poll, F-Zero won out and had its episode aired on September 4th. After its official debut, 4Kids had planned to continue airing The Cramp Twins in its timeslot but ultimately cancelled the show and aired Mew Mew uninterrupted. 4Kids had only attained the rights to the first 26 episodes of the series; 23 of which aired in the United States and the final three only seen on YTV in Canada and the Pop Girl channel in the United Kingdom. Unable to obtain the rights to the remainder of the episodes, the series was effectively cancelled. Despite initial outcry from fans of the anime over the localization of the series and extreme edits, the series performed well and was the highest-rated show of the season. The 4Kids version of the show was subsequently licensed out and redubbed for airing in France, Latin America, Australia, New Zealand, Portugal, Greece, South Africa and Israel. One of the Mew Mew Power DVD releases. 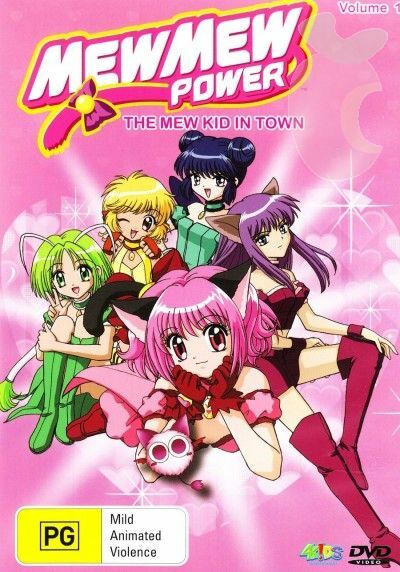 Mew Mew Power had never been released to home video in North America. Ten of the 4Kids episodes were released across two volumes in Australia and New Zealand by Magna Pacific. The complete 4Kids series was released in South Africa. The French version of the show released nine of the episodes through Warner Home Video France. Ares Films, licensor of the French version, managed to acquire the remaining 26 episodes and released them to DVD through AK Video. “The Mew Kid in Town (Turning into a Cat—Justice Lies in a Girl in Love ~Nya! )” (4/6/02 JAP, 2/26/05 US) – Ichigo’s date with Msaya leads to a vision of herself being merged with a cat which comes true when Ryou gives her a transformative pendant so she can battle a monster in the park. “Mew Two (A New Comrade – Justice Lies in a Real Lady ~Nya! )” (4/13/02 JAP, 3/5/05 US) – Ichigo begins working at Café Mew in order to begin her quest to find the other four Mew girls, and a chance encounter with Mint leads to the discovery that she is the second Mew. “Pooltergeist (Ghost Story from School: Finding the Ghost’s True Identity ~Nya! )” (4/20/02 JAP, 3/12/05 US) – Investigating a school haunting leads the Mews to find their next member, Lettuce, and the alien Kish appears to Ichigo with a kiss greeting. “The Lion Thing (A Tearful Date—the Secret I Can’t Tell Ayoama-kun ~Nya! )” (4/27/02 JAP, 3/19/05 US) – While on a date with Masaya, Ichigo runs off to transform and join her teammates when a lion is turned into a Chimera Anima. “Gymewstics (Stormy Rhythmic Gymnastics—Becoming a Star with a Cat’s Dance! ~Nya! )” (5/4/02 JAP, 3/26/05 US) – Ichigo is recruited to the school’s gymnastic team, but her performance is diminished when Kish attacks with a Chimera Anima. “Party ‘Til You Mew (The Piano of the Heart—it’s the Heart-Pounding Dance Party ~Nya! )” (5/11/02 JAP, 4/2/05 US) – A pianist playing at an event at the café has her spirit stolen by Kish to create a Chimera Anima, which is able to be affected by the pianist’s music. “Monkey See, Monkey Mew (Enter Pudding—The Ears and Tail are Part of the Act! 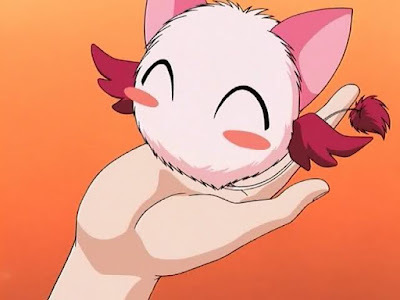 )” (5/18/02 JAP, 4/9/05 US) – Street performer Pudding discovers Ichigo’s cat attributes and wants her own for her act, but an attack by Kish reveals she’s in fact the next Mew girl. “Spa Blahs! (To the Hot Spring! The Mysterious Mountain’s Miracle of Love)” (5/25/02 JAP, 4/16/05 US) – The girls win a trip to a resort in the mountains where the spirit of a boy who opposes its presence is stolen by Kish and used to power his latest monster. “Do Mew Want to Dance? (Dearly Beloved Brother—the Memories Lie in the Picture)” (6/1/02 JAP, 4/23/05 US) – Ichigo attempts to help Mint and her brother reconcile their relationship, but a Chimera Anima attack puts that on hold. 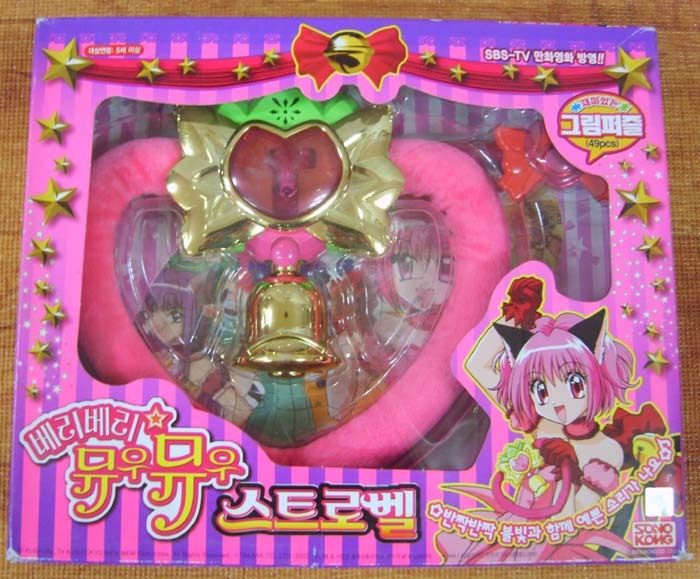 “Hollywood Mew Mew Part 1 (The Last Member—the Legendary Lonely Wolf)” (6/8/02 JAP, 4/30/05 US) – The final Mew girl is discovered as famous model Zakuro, but she dismisses the others and prefers to use her powers against the Chimera Anima on her own. 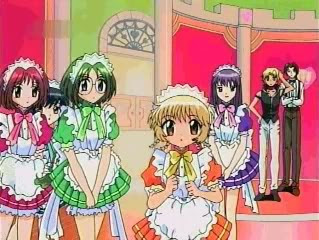 “The Taming of the Mew Part 2 (The Heart to Believe—All Five Makes Tokyo Mew Mew)” (6/15/02 JAP, 5/7/05 US) – Kish offers to return Zakuro to normal if she joins him and traps Mint, Lettuce and Pudding in an alternate dimension. “The Main Mew’s Muse (Identity Revealed—An Out of Season Cherry Tree Falls Away)” (6/22/02 JAP, 2/19/05 US) – The Mews have to destroy five trees infected by the aliens before they reach full bloom and release a poison gas. “Slime and Slime Again (Intersecting Hearts—Aoyama-kun is Targeted)” (6/29/02 JAP, 5/14/05 US) – Kish attempts to use Masaya to bring Ichigo to his side, but in failing Deep Blue sends Pie and Tart to aid him in his battle against the Mews. “Butterflies Are Freaky (Akasaka’s Secret—A Tale of Sad Love)” (7/6/02 JAP, 9/10/05 US) – The Mews attempt to help reconcile Keiichiro and his ex, Rei, but Pie and Tart use her spirit to power their latest Chimera Anima. “The Hero Lies in Mew (A Little Hero Masha—Friendship at the Risk of His Life)” (7/13/02 JAP, 9/17/05 US) – In order to prove himself useful, Masha joins the Mews in their latest fight and ends up captured by the aliens. “Books of Love (Lettuce’s Love—Longing in the Library)” (7/20/02 JAP, 9/24/05 US) – Lettuce develops a crush on a man she meets in the library, but a Chimera Anima attack leads her to discover he loves the librarian. “A Knight to Remember Part 1 (The Knight in Blue—I Will Protect You)” (7/27/02 JAP, 10/1/05 US) – Masha discovers the origins of the aliens while Ichigo takes ill and is unable to protect herself against their latest attack, which is when the mysterious Blue Knight appears to defend her. “My Knight in Blue Armor Part 2 (Mid-Summer’s Love—Ichigo’s Swaying Heart)” (8/3/02 JAP, 10/8/05 US) – After The Blue Knight and the Mews drive the aliens off, the Mews begin to wonder who the Knight really is and suspect Ryou. “A Girl With a Porpoise (The Power of Kindness—O Wish, Come True in the Sea)” (8/10/02 JAP, 10/15/05 US) – Despite her inability to swim, Lettuce attempts to help a girl at the beach with her own swimming confidence when Chimera Animas attack. “Daughter of the Year (Memories of Mother—Onee-chan is in Trouble)” (8/17/02 JAP, 10/22/05 US) – When Pudding takes sick the Mews learn that she’s responsible for caring for her five siblings, and Pie and Tart take her sister’s teacher’s spirit for their next Chimera Anima. “One Flew Out of the Mew Mew’s Nest (Sparks of the Heart—Ichigo and Mint at Odds)” (8/24/02 JAP, 10/29/05 US) – A substance called Mew Aqua and a dream where she has a conversation with her spirit animal has Mint concerned about their mission and eventually leads her to quit the team. “Buggin’ (Farewell Summer—Ichigo’s Longest Day)” (8/31/02 JAP, 11/5/05 US) – Ichigo needs to finish her homework before school starts, but Masaya, busted water pipes and an alien attack conspire against her. “I’ve Got a Crush on Mew (Sudden Love—Accept Girls’ Hearts! )” (9/7/02 JAP, 11/12/05 US) – Ichigo’s friends have crushes on Ryou and Keiichiro but their advances are spurned when the boys are too busy searching for Mew Aqua to acknowledge them. “Diamonds Are a Girl’s Worst Enemy (A Mysterious Gem—Brilliance is Within You! )” (9/14/02 JAP) – A necklace may contain Mew Aqua, and a battle erupts between the Mews and the aliens for it. “The Hunt for Blue Aqua Part 1 (Love’s Hurdle—Many Obstacles to Ichigo’s Love)” (9/21/02 JAP) – The Mews and aliens search for Mew Aqua underground while Kish plants a cocoon on Tokyo Tower that will hatch a pollutant-spewing moth over the city. “Coo Coo Cocoon Part 2 (Stop, Time! Overwhelemed with Sentimental Feeling” (9/28/02 JAP) – Battling the moth leads to the discovery of the Mew Aqua, which combines with an ancient rod they found to create the Mew Aqua Rod. “I Love You—Aoyama-kin’s Shocking Declaration” (10/5/02) – Masaya confesses his love for Ichigo, and when she goes to kiss him after the Mews’ latest battle she turns into a black cat. “Kitty Panic! The Key to the Mystery is Her Kiss” (10/12/02) – After an adventure as a cat, Ichigo is returned to human form and informed by Ryou the changes will only end when the aliens are gone. “A Forbidden Love? I Can Understand Cats ~Nya!” (10/19/02) – Ichigo discovers she maintains the ability to communicate with cats and the Mews agree to help one reunite with his love. “Be Honest! Unspoken Love in the Crystal Ball” (10/26/02) – The aliens target a fortune teller, believing her crystal ball contains traces of Mew Aqua. “Father’s Back—One-Game Match for Ichigo!” (11/2/02) – Ichigo’s father learns about Masaya and challenges him to a kendo match for the right to date his daughter. “Princess Fight—The Hero Can’t be Bought For Money” (11/9/02) – Mint plans to surprise the others with some special tea, but it’s stolen by Kish and her “eternal rival”, Kanna. “A Fiance Appears—Pudding’s Fated Marriage? !” (11/16/02) – Yuebin, an associate of Pudding’s father, defeats Pudding to learn the family fighting style and to make her his fiancée. “The Most Important Matter—The Ability to Trust in Someone” (11/23/02) – A famous doll maker tricks Lettuce into helping her before having her spirit taken by Kish. “Don’t Cry, Lonely Little Zakuro” (11/30/02) – Zakuro befriends a lonely girl who becomes targeted by Kish, believing a present her parents sent contains Mew Aqua. “Shirogane’s Past: The Secret of the Mew Mew’s Birth!” (12/7/02) – After discovering Ryou can change into a cat as well, Ryou finally reveals the origin behind the Mew Mews. “The Shining Tear: Celebrating Christmas with Just the Two of Us” (12/14/02) – Ichigo gets Masaya a present to convey her feelings, but an alien attack reveals the presence of Mew Aqua at the top of a Christmas tree. “Miracle of the Holy Night—No Secrets Anymore” (12/21/02) – After Masaya is injured by a Piece of Mew Aqua, she finally confesses her secret and discovers he already knew. “The Stolen Dream—Sweet Trap of the Lavender” (12/28/02) – Pie’s latest Chimera Anima puts Ichigo to sleep and takes her place in order to ambush the team. “Two Becoming Friends? Pudding in Imminent Danger!” (1/4/03) – Tart’s plot to sink the city ends up trapping him and Pudding underground. “The Winds Bring Happiness—A Heartfelt Prayer” (1/11/03) – Fish are transformed in order to pollute the bay and the Mew Aqua around Ryou’s neck may be the key to defeating them all. “Zakuro’s Dilemma: Only Four Mew Mews Now?” (1/18/03) – Zakuro, losing faith in their mission, considers accepting a role in Hollywood requiring her to move to America. “Friend or Foe? Fight, Oneesama!” (1/25/03) – Zakuro appears to have betrayed the Mews for the aliens while more Mew Aqua appears in the possession of a swan. “The City Turns into a Forest! What Protects Ichigo’s Smile” (2/1/03) – A forest springs up throughout Tokyo and Tart turns a large Mew Aqua tree into a Chimera Anima. “The Riddle Dissolves! The Truth About the Blue Knight” (2/8/03) – When Ichigo is attacked by Kish, Masaya comes to her defense and transforms into the Blue Knight. “New Reinforcement! Protect the Earth Together” (2/15/03) – Masaya is invited onto the team just as they investigate possible Mew Aqua in the river. “The Power of Love! I Will Protect Aoyama-kun! !” (2/22/03) – Deep Blue plots the end of the Blue Knight by ordering Ichigo to be taken hostage. “The Labyrinth of the Alternate Dimension! Kish’s Gamble! !” (3/1/03) – Kish attacks Masaya who discovers his powers won’t work unless he’s protecting Ichigo. “The Awakening of Blue—Another Appearance!” (3/8/03) – Kish plans to use the Blue Knight’s powers to save their world, and the next time Masaya transforms he becomes Deep Blue. “Ichigo’s Trial! I Am a Mew Mew” (3/15/03) – Deep Blue proves too powerful for the Mews and uses his sword to destroy Tokyo while Ichigo realizes Masaya is gone. “The Final Battle! I Believe in Your Smile” (3/22/03) – Ichigo invades Deep Blue’s base, and after a massive release of energy Masaya finally regains control over Deep Blue. “For the Earth’s Future, We’ll Serve You ~Nyan!” (3/29/03) – Masaya distracts Deep Blue long enough for Ichigo to attack their body, destroying the Mew Aqua within and restoring the city.